Molecular imprinting is an effective method of imparting highly specific and selective recognition sites in synthetic polymers. A molecule of interest (target) is used as the template and allowed to pre-associate with polymerisable molecules referred to as the functional monomers. The degree of association between the monomer and the template is mostly based on simple molecular interactions such as H-bonding, or can be covalently attached to the monomer. The association between the template and monomer is fixed in place by polymerisation in the presence of a huge amount non-interacting monomer (e.g. crosslinker), which can impart the robustness required for the polymer. The template is extracted from the polymer to leave behind a cavity capable of recognising and resorbing the target. 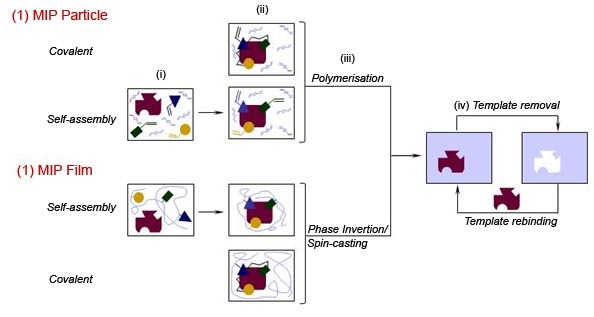 Overview of the molecular imprinting process: (1) MIP Particles are generated by the self-assembly in-situ imprinting approach by: (i). Combining the target/template with the functional and matrix monomers in solution; (ii) Allowing the functional monomers and target/template to pre-associate; (iii) Polymerising the solution mixture; (iv) Removing the target/template from the bulk polymer leaving an idealised cavity capable of rebinding the target/template. (2) MIP films can be generated by the self-assembly post-polymerisation imprinting approach by: (i) Combining the target/template with the copolymer of functional and matrix monomers in solution; (ii) Allowing the complimentary functional moieties to align with the target/template in solution; (iii) Coagulating the solution (a small amount uniformly spread on a glass substrate in a non-solvent; or spin-casting; (iv) As with (1), target/template removal to obtain the binding cavity. Alternatively, MIPs can be generated by the covalent approach in which the target/template is covalently attached to the functional monomer before polymerisation. The target/template can be extracted from the bulk polymer by cleaving the covalent linkage. Target/template can be rebound by covalently re-attaching the molecule (full covalent) or by virtue of intermolecular interactions, e.g. H-bonding (semi-covalent). Grafting of MIPs onto a preformed polymer surface is possible by the use of iniferters (polymerisation initiator, transfer agent and terminator as one) or RAFT agents, in particular the carbamates, which are capable of reversible initiation and termination, thus providing flexibility in MIP design - that of generating composite layers of MIP systems selective to a particular target which can be utilised for multicomponent separation and detection. Further, specific structural features of the polymer necessary for optimal performance can now be introduced on a need-to-need basis rather than as a compromise option, which can sometimes jeopardise the MIP performance. This technique also allows the introduction of a detection function, e.g. gold nanoparticles, unto the MIP structure which is very difficult to do in traditional MIP systems. Particulate or monolithic MIPs have been traditionally utilised for most applications, however, MIP thin films have been identified to be the best format suited for sensing applications. MIP films can be prepared by post-polymerisation imprinting of linear copolymers and 'sandwich' (between glass slides) bulk imprinting of highly crosslinked polymers. The former lacks the rigidity provided by the crosslinker to keep the binding cavities intact; the latter suffers from inflexibility caused by too much crosslinking. This study aims to develop novel soluble lightly crosslinked/highly branched molecularly imprinted polymers, which can easily be processed into films, by controlling the degree of crosslinking and branching of polymers. Initial results showed successful rebinding of the target template suggesting that recognition cavities can still be formed and held intact under conditions of controlled crosslinking. This study will utilise controlled radical polymerisation (CRP) techniques in order to regulate the degree of crosslinking in the MIP. The CRP process can be based on various initiator/terminator systems, in particular thiols. The use of thiols (R-SH) as chain transfer agents is favourable because it offers an added capability of gold complexation and subsequently, analyte detection via gold nanoparticles. The introduction of the transduction function in the MIP can be achieved by utilising conductive polymers (i.e. polythiophene). Copolymers made up of recognition (MIP) and transduction blocks can be prepared from monomers of the like shown in Figure 4 ; MIP films can then be generated either by the phase inversion or mini-emulsion technique. The mini-emulsion generated film will be interesting since the nanoparticles that will be obtained from ultrasonication are expected to be in a core-shell configuration and can be controlled, by the choice of solvents, such that the core will be the conductive domain and the more exposed shell bearing the recognition domain. Y. Yagci & L. Toppare, Polym. Int., 52, 1573 (2003); F. Yilmaz, O. Sel, Y. Guner, L. Toppare, Y. Yagci, J. Macromol. Sci. A, A41, 401 (2004). Similarly, the technique illustrated above for the preparation of MIP core-shell particles can be applied for the preparation of various types of novel conductive nanoparticles for use in photovoltaic devices (refer to Assoc. Prof. Erica Wanless' and Dr. Warwick Belcher's project). Whilst the polymers that are typically used for the preparation of nanoparticles are on the market, their availability is not guaranteed, their quality has not been consistent, and only polymers of limited molecular weight, composition and architecture are available. Since the performance of electroactive nanoparticles can be significantly affected by the quality of the constituent polymers, as an alternative approach, these electroactive polymers (e.g. F8BT, PFB, P3HT, PCBM) will be synthesised in the laboratory to suit the device requirements. This approach will provide not only polymers of various composition and topology (i.e. block, alternating, graft) which are not commercially available, but also allows regulation of molecular weight, polydispersity and chain length and offers additional opportunities for tuning electronic properties.